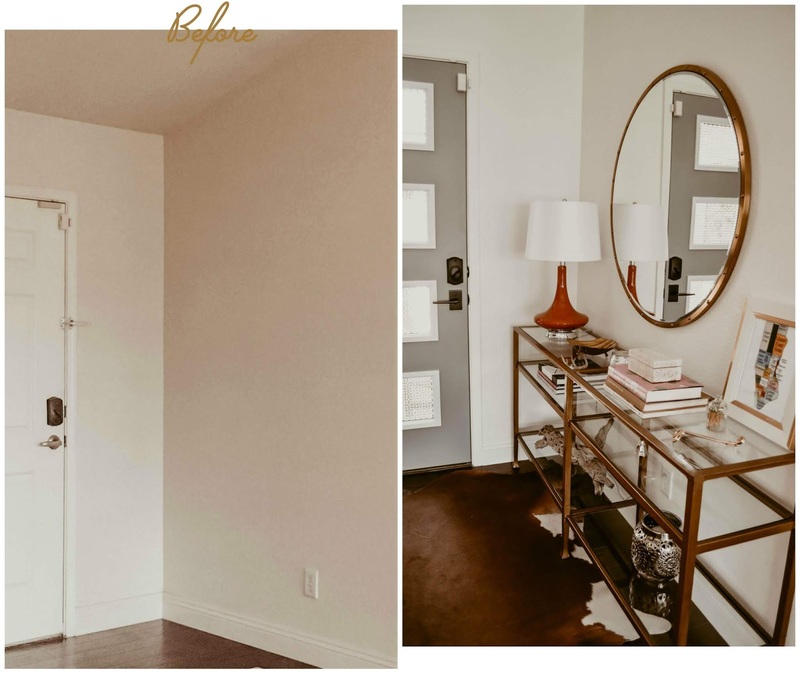 A proper entryway is one of the most important must-have items high on my list whenever I’m house or apartment hunting. 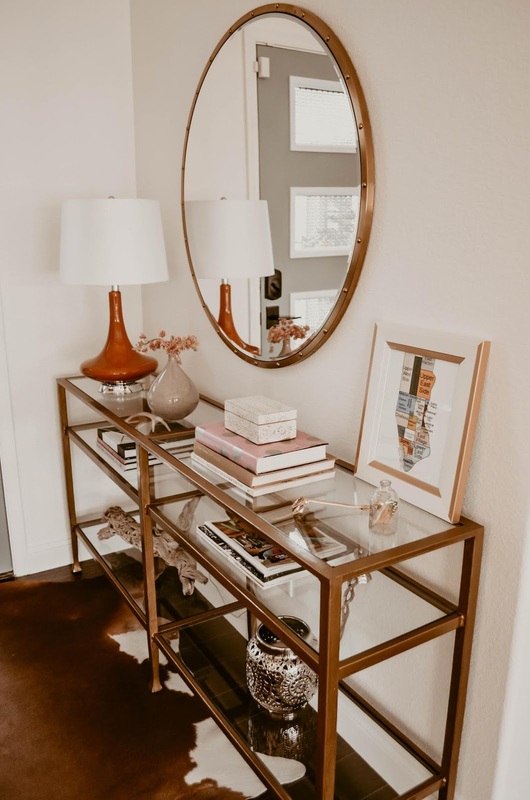 I’m big on having that separation for it not only gives a visual clue of what’s to come before you see the style of the rest of the house, but also serves to create a good first impression. It’s like a well-plated tasty appetizer that creates this savory anticipation before the main course. In our current house, the front door opens wide into our living room. 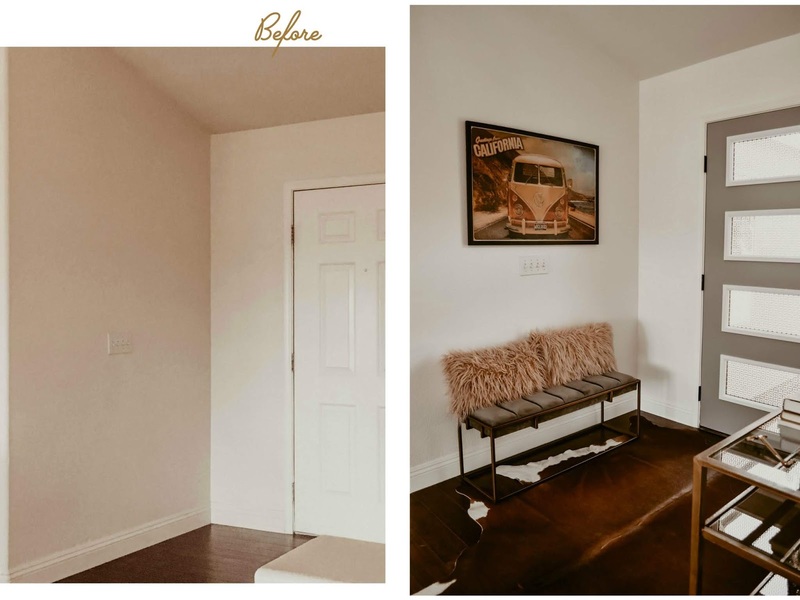 However, since there’s an alcove landing about eight to nine and a half feet deep that leads down into a sunken living room, I felt this area still offered me the opportunity to create an inviting stylish space upon entering the home. 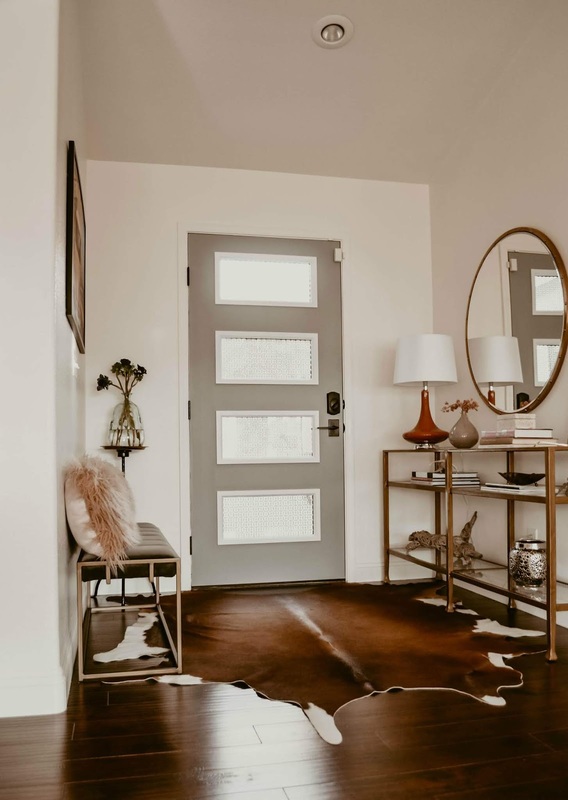 One of the first things we couldn't wait to do was to install a new front door that would let light in, but we sure didn't want to settle on just any door... we were definitely set on getting one with a mid-century modern flair. So, we had one made and painted the interior side grey to match the rest of our interior doors. And what a big difference that simple change made! The amount of light that came flooding through the glass panels highlighting the chain link design in between the panes; brought such life to the whole room. We couldn't be any more pleased with how it turned out. For us, the entryway isn’t necessarily a place to throw down our coats, mail, and keys per se. Since we mainly come into our house through the garage entryway, that's where we conveniently hang our keys and then we bring our mail directly to our home offices, so this eliminated the need for a spot to place those items at our main front door. 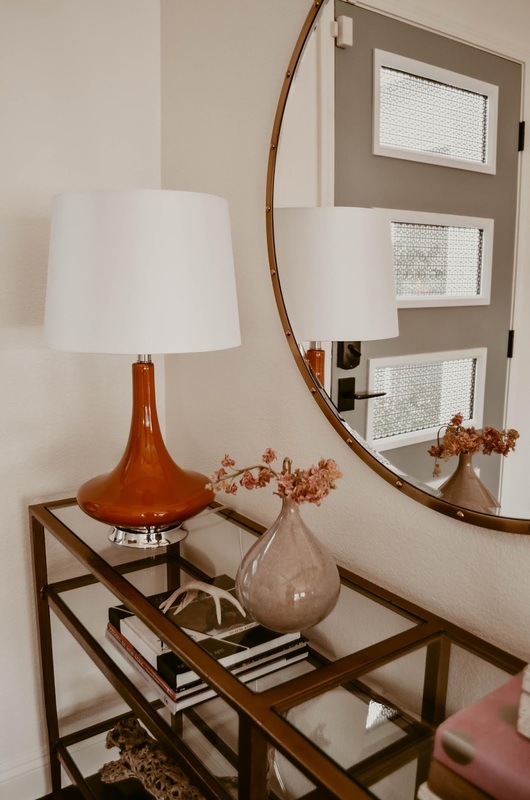 As for our coats, there is a tiny coat closet immediately steps away from either entry point, therefore, only a few essentials were needed to bring our front foyer together and create an intimate and stylish entryway. 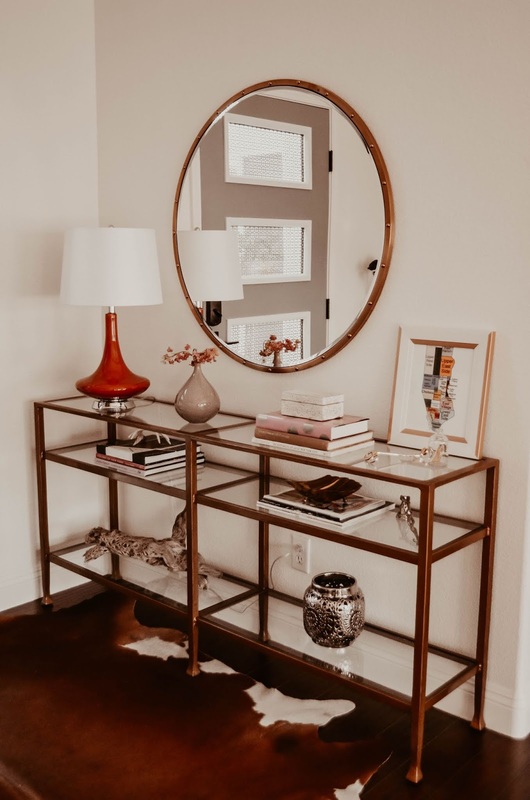 I started out by donning the floor with a cowhide rug, then placed a long console table (shown here in our old NYC apartment) anchored by a large round mirror with its gleaming brass finish adding light and depth to one side of the wall. Of course, an entryway isn’t complete without proper seating. Finding the right stylish as well as functional bench was critical in providing a place to sit and slip on and off shoes. To brighten up that area, I filled the wall above it with a cheery art memento we found at a favorite vintage art shop in L.A. One of our dreams is to one day buy one of these legendary VW buses for our road trip adventures but for now, this dream lives on our wall as picturesque art until it eventually someday manifests itself. No matter how many centerpieces you have in place, the fact is that a well-pulled-together design is only as good as its finishing pieces. 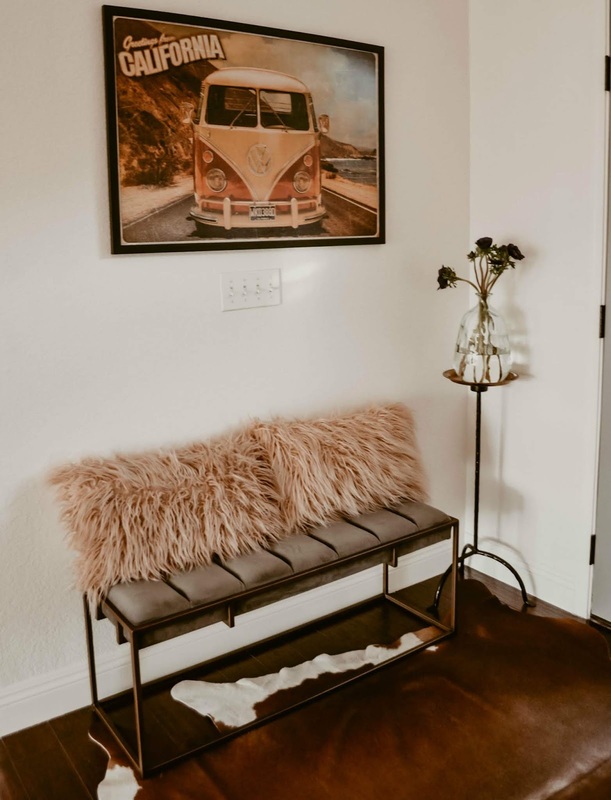 Plush, blush-colored faux fur pillows sit atop the grey west elm velvet covered bench seat, alongside a small corner tray table which I made (and will share the diy in another post) makes for a perfect spot to liven up that corner with my flowers and/or branches of the week. A retro lamp is strategically placed with a low-temperature bulb to create the perfect soothing pool of light at night. I alternate between fresh flowers and a candle on the console depending on the season and now that we’ve entered Spring, most times, I place a small vase with fresh flowers in lieu of the candle. Finally, a selection of curated books, a dainty Turkish box, a framed New York city map to remind us of home, a bottle of matches, a brass candle wick trimmer, and a piece of desert driftwood gifted from a friend over five years ago tie everything harmoniously together. 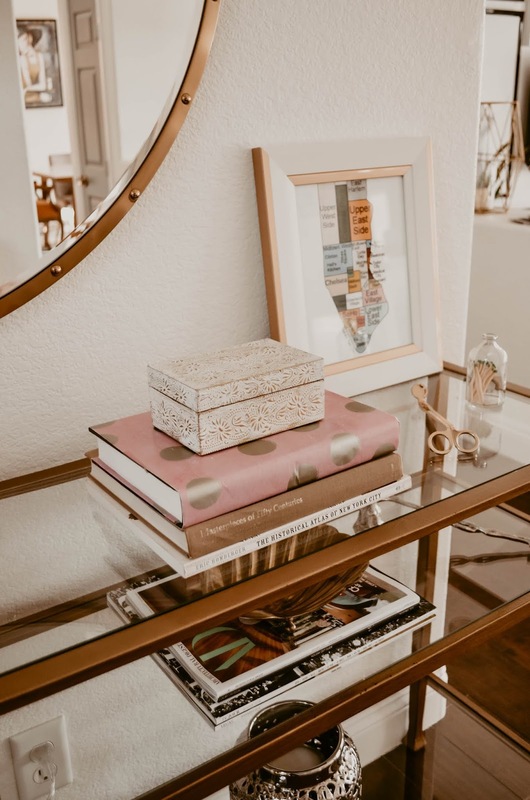 Ultimately, you want to create a warm inviting space that welcomes you to leave behind whatever stress you may have faced that day before fully entering into your home – making you feel that you’re right where you want to be.